Smells good, looks good – and no, I’m not talking about coming home to a tasty dinner prepared by my amazing wife. I’m referring to my initial response to opening up the box containing the Far Horizon Traders Ascent Rucksack. The rich leather aroma is tantalizing and long lasting with this bag. It has garnered attention in my office for the past week simply based on its pleasant fragrance – and most people haven’t even seen or touched the rucksack yet. All of the bags from Far Horizon Traders (FHT) are handmade in several locations around the globe. Matt, the founder of FHT, has traveled extensively over the years and through his adventures has met and worked with skilled leather craftsmen with whom he has partnered to offer unique, high quality bags with conventional cow leather, camel leather, and water buffalo leather. “Everybody’s got a water buffalo, yours is fast but mine is slow…” I always think of that Veggie Tales song when I read the words ‘water buffalo’. The Far Horizon Traders Ascent Rucksack is handmade in the highlands of Central Mexico. It’s constructed of 4-5oz. full grain, vegetable tanned cowhide and has a nice earthy brown hue to it that’s pleasing to the eye. Heavy duty hardware is used in the grommets that surround the opening – through which a heavy strip of leather runs acting as a drawstring closure. 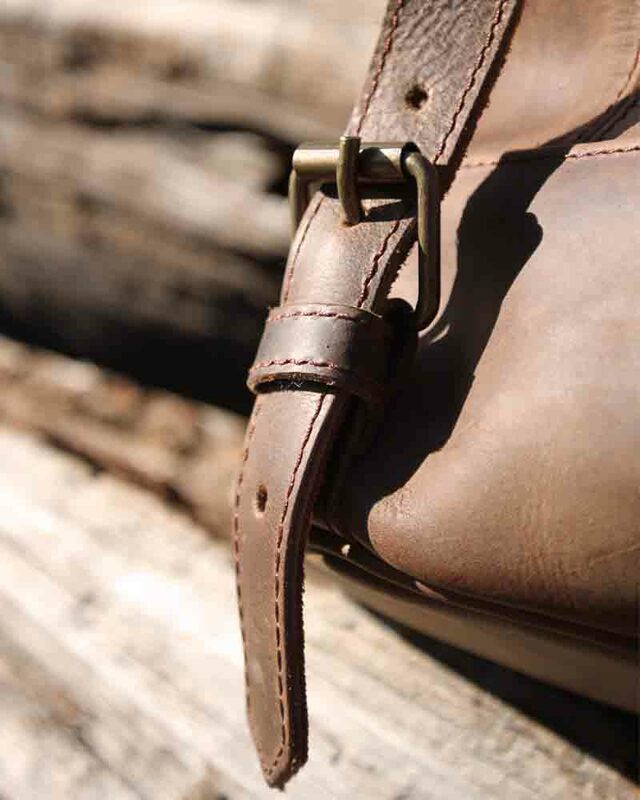 Matching “aged” brass buckles are used to secure the bag’s lid and for adjusting the carry straps. There is one well-placed pocket on the outside of the rucksack that is ideal for a boarding pass while traveling or other small wares. The inside features a heavy canvas/twill liner in a classic off-white color, which makes it easy to view and locate items inside the bag without getting frustrated. Also inside, you’ll find a leather pocket, several pen loops, and a leather key lanyard. I like heavy duty stuff – it’s just the way I am. I have a ¾ ton truck, a ¾ ton Yukon XL, big sons, big tools…the list goes on. And, I like thick, heavy leather. Initially I was a little skeptical of the FHT Ascent Rucksack. It’s thinner and lighter than my other leather goods. So, what did I do? I loaded it up with my usual items. My MacBook Air, iPad, camera, assorted gear, pens, and other miscellaneous EDC (every day carry) items went into the rucksack to test its mettle. While exploring one of our beautiful, local rivers the rucksack performed without issue. It was comfortable – no complaints. The FHT Ascent Rucksack has exceeded my initial expectations. Its 18”h x 12”w x 9”d size certainly will handle plenty of gear and all the while doing it in high style. The strap/buckle system is easy to use and frustration free when you want to access the contents of the bag. Long term, my only concern is the skinny shoulder straps. If there is anything that calls for improvement on the Ascent Rucksack, it’s an upgrade in the shoulder strap department. Even if the same 4-5 oz. leather is used, but widened from the current one inch in width to even just 1.5 inches, I think that would provide additional substance to eliminate apprehension when loading it up and carrying it on long adventures. And, heavier straps will definitely serve it well for many years. The small shoulder pads are sufficient in distributing the weight comfortably, enabling you to wear it for extended periods of time. 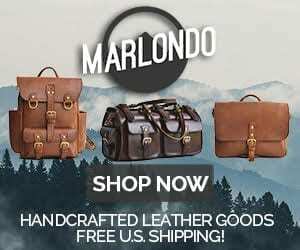 You will need to search far and wide to find a better handmade, quality leather bag at this price point. With that and Far Horizon Traders full satisfaction guarantee, it’s even more appealing. If you’re looking for a light, low bulk, handmade leather bag with supple, attractive leather that’s cut and assembled by hand, then the Far Horizon Traders Ascent Rucksack should a serious contender as BestLeather.org considers this a good value/cost option. And…you’ll really like the way it smells. Check out the Far Horizon Traders Ascent Rucksack here. Click here to see our other leather backpack reviews. 5 Comments on "Far Horizon Traders Ascent Rucksack Review – $349.99"